This week I was sent an article about a group in Seattle who are running therapeutic social skills workshops using Dungeons and Dragons as their primary tool. Read it: it’s quite interesting. The article talks about how the children involved gain an identification with the characters they are playing, understanding the repercussions of their actions, and the impact of what they say and do on others. It also talks about how they gain confidence to interact socially with others and be creative with people watching, two skills that are very difficult to learn. It was interesting, but not surprising. No, not really. It’s like anything where someone makes claims about the benefits of something you know well. I’ve seen all of this with my own eyes. Over several years I worked alongside the Education Business Partnership to deliver “Literacy Days” for secondary school boys who were struggling with English. We never called them that, but that’s what they were. We did some research and found out that many of them liked spy stories, so we put together a day where they would be spies and save the City of Portsmouth from some kind of threat. In this case it would be a former KGB agent who had a grudge against the museum I worked in and wanted to blow it up. Along the way they would have to solve various clues that involved reading (and a significant amount of running around) and get more information by writing emails, letters and faxes. Can you tell I had a lot of fun putting this together? Over the course of the day they slowly but surely found out what the threat was and tightened the noose on our would-be “terrorist”. They discovered who he was based on MI6 personnel files. They wrote to the Indian Home Office, who had imprisoned their suspect for some crime. They found out he had a grudge against Portsmouth and had recently escaped. During the day, the threat revealed itself and the tension ramped up. They discovered that a large amount of radioactive material had been stolen from a power station. They also discovered that the terrorist had infiltrated the museum staff! So, there is a member of staff who was planning something involving a bomb. All the groups needed to do was stop them. Before the terrorist did anything bad. Bear in mind that, at no point, had we told any of them what was happening: they followed the clues and came to their own conclusions. Fortunately, they were the conclusions we hoped they would come to. None of this affected the fact that, midway through the afternoon, they knew they had limited time to work out how to stop the terrorist’s plans and to catch the miscreant. Which is why the climax of the day saw one group of students, clad in paper suits, attempting to locate and defuse an explosive device before it went off. At the same time, the other group, armed with a net, attempted to apprehend the terrorist as they tried to get away. It was incredible. There was a palpable sense of achievement in the group as a whole. They’d really managed to succeed at something challenging. There may even have been high fives. The best bit was that they had managed to do this themselves, but no-one mentioned that they had done any reading or writing. Certainly, no-one mentioned literacy which was, after all, the point of the event. Everyone that is except two young men. They actually asked to come in to school just so they could do some writing. I never found out what they were excluded for, I assume it was not trivial. For them to ask if they could come in order to do some extra lessons shocked the teachers so much they felt they needed to tell me. All of a sudden I’m telling you stories, about teachers telling me stories, about stories told to them by students, because of the stories we’ve all told together. This, obviously, was one of those moments when all the hard work is worthwhile. It doesn’t happen every time, but I really love the surprising creativity that comes out of storytelling and roleplaying sessions. 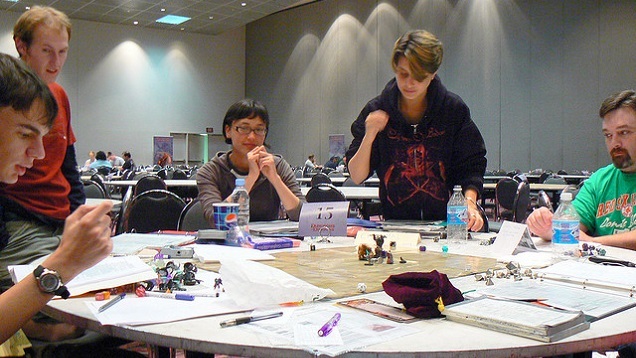 So, I really wasn’t surprised when I heard about Dungeons and Dragons being used to help people with their social skills because I’ve seen it first hand, every time I run one of these sessions.